Motherhood (and parenthood) open our eyes to many, many new experiences. We discover a new level of intensity in our emotions. We become acutely aware of someone else's schedule; someone else's needs; someone else's health. We feel a responsibility and burden more immense than we have never dreamed of carrying, but the load is lightened by the overwhelming and indescribable love we feel for our children. We also, in the course of parenthood, learn to appreciate - simple things - like never before. For example, privacy - as soon as the first child is mobile, privacy disappears. Every time we turn around, there is a little person under our feet, looking over our shoulder, or knocking on the other side of the bathroom door. And what about sleep?? Remember when you could pull and all-nighter in college?? Parenthood brings a whole new level of tiredness which makes us need and appreciate sleep so much more. Today (and most days), I have an appreciation that has grown tremendously in the past few years for something I certainly took for granted before motherhood - Silence. I went on a field trip with my first grader today and spent about 4 hours surrounded by squeals, yells, and incessant talking. Then I came home to my three daughters and, like every other day, there was more squealing, yelling, and incessant talking topped off with some singing, giggling, fighting, and random noise making. There was absolutely no silence. I cannot even begin to count the number of times I said "Shhhhhh!" today. Then, there is the inevitable decibel climb that occurs - I "Shhhh" but they don't hear me over their own noise. So, I say "Be Quieter" and I am again unheard (or ignored) through their static. I get louder - they get louder - I get louder to be heard - and so on and so forth. It's maddening! Why is it that children are so loud all the time? It's kind of like WRITING IN ALL CAPITAL LETTERS ALL THE TIME. THERE IS NO LOGICAL EXPLANATION FOR DOING IT; NO REASON TO ADD EMPHASIS TO EVERY SINGLE WORD. IT IS SENSELESS AND UNNATURAL. PLUS, AFTER A WHILE, IT GETS REALLY ANNOYING, DOESN'T IT??? So why is it that kids seem to talk "in all capitals" all the time? I have a couple theories. One is that they are just so used to noise - T.V., radio, etc. - that, to them, it is actually the silence that seems unnatural. It is also this constant background noise that spurs their continual decibel climb upward. Another, more ethereal possibility is that children are just filled with such exuberance and excitement and joy they simply can't help it. (Hey, I warned you it was ethereal!) The last possibility is that I'm just getting old. I used to teach preschoolers for Heaven's sake! I don't recall the noise of my students getting under my skin ten years ago. However, after a day like today, I swear my ears were seconds away from bloodshed. Pretty sure I look like this sometimes - I Know I feel like this! Somewhere in the back of my mind I can hear my mom saying "You will miss all that noise some day. When you bring the kids to visit, the silence is deafening after you leave!" I'm sure that is true, but for now, maybe I'll just invest in some industrial strength ear plugs! Do you have any secret weapons against the noise??? Hahaha! Well said... You and I need to get together and create a fashionable ear plug company. Moms everywhere will rejoice. We'll be millionaires! 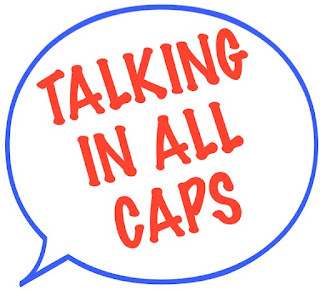 As a Kindergarten teacher, I know EXACTLY what you mean by kids talking in all caps. The kids in my class have been talking in all caps for two days. T.G.I.F! Hopefully, over the weekend, they will turn down their volume for me. My ears are certainly near the point of bloodshed. I wish I did. My kids are loud talkers too!! I don't get it. Personally I think they're just so used to the noise that they just talk over it rather than turning it off.